Knee-deep in the Ecuador leg of my three-week holiday vaca, I felt a void on many nights when out with family and friends, both new and old. But It wasn’t until my uncle broke out his Johnnie Walker stash to lift our Christmas spirits, both literally and figuratively, that it hit me – I missed shared beer. Before you send me the number to Alcoholics Anonymous though, let me explain. 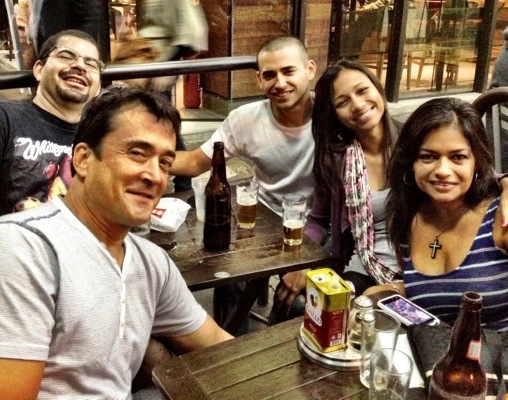 Brazil’s bar culture, which I’ve immersed myself in over the last 23 months, leans heavily on 600-milli bottles of nearly-frozen brew, which are shared by everyone at the table and thrown down in small glasses. The main reason it’s done is to keep the beer ice-cold, but at times, the social effect places you in what seems like the libationary epicenter of the universe. Given that the beer is weaker here than in most countries, it’s not the booze talking either. Turns out cerveja is simply appreciated most when shared – who knew? During the same South American trip, I shared bottles of Carménère with new friends over a spectacular seafood dinner in Santiago’s bohemian Bellavista neighborhood. More commonplace than the first two, but still relevant nonetheless. Beer, whiskey, and wine – all magnified in effect when shared. Not exactly a life-changing revelation, but it reminded me of the book and movie Into The Wild, in which the protagonist Chris McCandless realizes his biggest lesson all too late – that happiness is best when shared. My travels have been characterized by solo trips as well, but I’m the first to admit that the best moments have come alongside others, whether its family in Ecuador, friendly strangers in Santiago, or new friends in Brazil. Solo travel lets you to seek out what you want to do and see most, but only when you find someone to share the moment with does it reach its full potential. Brazil shares beer. Santiago shares wine. Ecuador shares Scotch. I share travel experiences. How do you share happiness? Thank you for specifying.. Sharing is caring! That’s really a great question. I have been told that people love hearing about my travel stories whether we are in person or they are reading my blog. In my normal life I share happiness by doing things for others just because I can. One thing I do is make my niece’s baby food. That saves her parents $$, makes my niece super happy because her food is organic and healthy, and all of us end up being happy. That doesn’t have anything to do with traveling so I hope that’s ok! Thanks for asking this question. Doesn’t have to be travel-related at all, of course not. Baby food, beer, laughter – it doesn’t matter how you do it as long as you’re doing it. Thanks for reading, Roni. Safe travels!